More and more often leaseholders are asking for information… and they want it electronically. Through the Leaseholder Portal they can choose to receive their demands via email, view their account online, report problems and share a noticeboard with other residents. And Property Managers can use it to publish updates to their leaseholders. You don’t need to pay for consultants or technical experts to get you up-and-running; simply sign-up and start to enter information about your properties … Within 48 hours you can be ready to go. The Blocks Online system has been intuitively designed, there is no need for expensive training courses, simply sign-up for the service and off you go. Since our software is in the cloud you can access it wherever you have an internet connection … which is almost everywhere! So if you are a managing agent with multiple branches, as long as they have internet connections, they can all access the software. There is no need for you to worry about all of you critical business data. 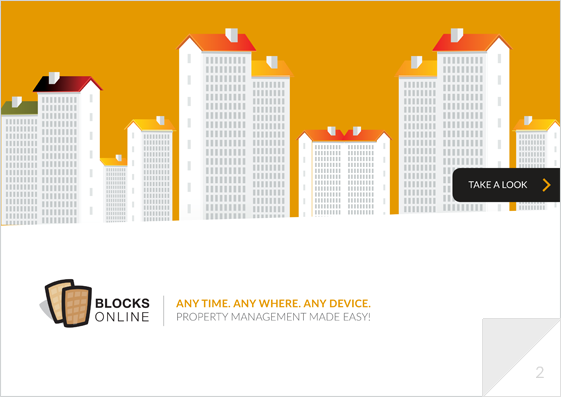 Blocks Online ensures that all of your data is fully backed-up to the cloud everyday …. so you don’t have to pay for lots of expensive technical equipment. And should a catastrophe happen to your office, you know that all of your data is safe. Many of our competitors will make a charge when their software is upgraded, or encourage you to pay extra for the ‘new version’. At Blocks Online, all clients share a single code-set, which means that whenever new software is produced all clients start to use it, just like they do at Amazon or eBay. 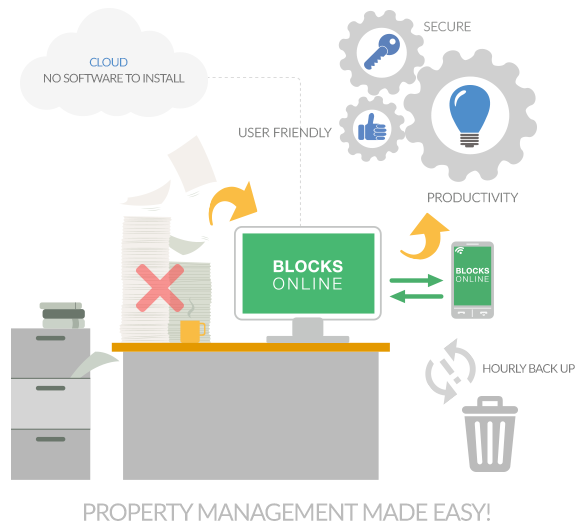 With Blocks Online, there are no large up-front costs – You don’t have to pay for an expensive licence or lots of new technical kit. You can pay on a month-by-month basis and you only pay for the service that you use. Leaseholders have 24 x 7 access to their account through the Portal, branded with your logo. And, if you wish, you can put a link on your web-site to the Portal to make access easier for your leaseholders. Leaseholders have access to their agent’s contact details and can maintain their own email and telephone number contact details. A noticeboard is available for all leaseholders in the block to share information and thoughts with other property owners. Leaseholders can post notices and add comments to each other’s notices. A user can report any notice or comment which they believe is inappropriate. A property manager has full control of posted comments and they can remove any offensive posts if they deem it inappropriate. Leaseholders can report a problem with their property at any time of the day or night. They no longer have to call their PM if there is an issue they wish to report. * Integration with the Ticket Module By taking the Ticket module, a new ticket will be created whenever a problem is reported. As work is undertaken on the ticket, members of staff have the option to post comments back to leaseholders. In this way, leaseholders are kept updated on the actions you are taking. Key documents Leaseholders can view insurance policies, service charge accounts, house rules, AGM minutes and other similar documents that are published to them. Demands preferences Leaseholders can choose to receive their demands via email or in printed form. Receipt Leaseholders can choose to have a receipt emailed to them whenever they make a payment. * Integration with the Ticket Module By taking the Ticket module, leaseholders can choose which type of email updates they receive regarding tickets. 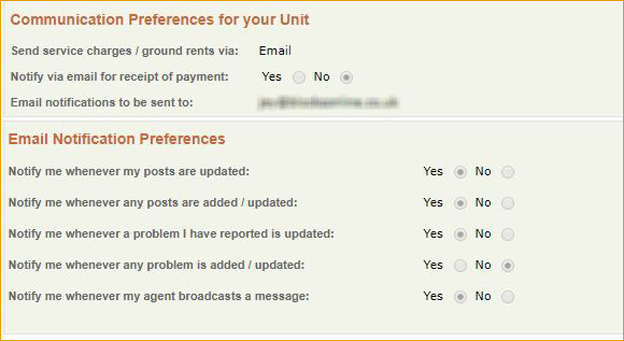 The ticketing module is integrated with the Leaseholder Portal. When a user reports a problem a ticket is automatically created, ready for action by the PM. And the PM will receive an email notification when the problem is reported.